Local Yarn Store Day Event 4/21 with the Makin' Bacon Food Truck! 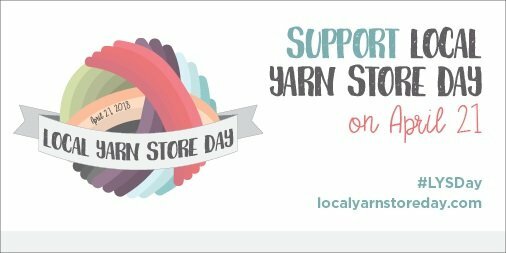 Inaugural Local Yarn Store Day Event! We know yarn stimulates your senses: soaking in the entire spectrum of color, sinking your fingers into decadent skeins of the softest fibers, settling into a cozy chair to page through the latest patterns. We also know the only place to get the complete experience is in the store. Come celebrate everything you love about yarn at our Local Yarn Store Day event. We'll be featuring many items from your favorite yarn companies and designers, items only available at brick-and-mortar yarn shops! Have friends who'd like to learn more? Bring them along! Remember to check in on social media and share your excitement! Whole Hog Special (WHS) - Includes choice of entree below, side of bacon-topped Mac & Cheese, and a dessert. Street Style 1/4 Pound Bratwurst - Served on a Barney's Bakery bun with mayo, cheese, grilled onions, and bacon. Street Style 1/2 Pound All-Beef Dog - Served on a Barney's Bakery bun with mayo, cheese, grilled onions, and bacon. Pulled Pork Sandwich - Slow-roasted pulled pork piled high on a fresh bun, topped with BBQ sauce. Pulled Pork Street Bowl - Creamy Mac & Cheese topped with pulled pork, BBQ sauce, and grilled onions. Chocolate Bacon Brownie - We'd never forget our dessert fans! Try one of these beauties for $2... you'll be glad you did! while supporting A Piece of Ewe!